These guilt-free summer treats from the EatingWell Test Kitchen are all about 100 calories or less per serving and every bit as satisfying as those diet-busting desserts that seem to tempt us at every turn in the summer. Tart raspberry filling is swirled into a low-fat cream filling in these beautiful bars. They’re a festive treat for a summer picnic or party. Bonus: 2 grams fiber. These pops pack in icy cold, chunky bits of fruit. For a grown-up twist, try adding 1 to 2 teaspoons finely chopped fresh mint, lemon verbena or basil. Bonus: 1 gram fiber. No need to overdo it on a loaded banana split sundae. 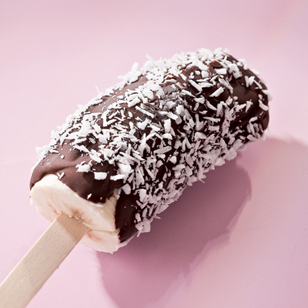 These chocolaty banana pops are the perfect frozen treat to satisfy your craving. Bonus: 2 grams fiber. A touch of lemon juice and Grand Marnier add zippy citrus notes to fresh strawberries. Bonus: 2 grams fiber. Inspired by creamy watermelon sherbet, this light and refreshing dessert captures the essence of summer. Even if you don’t have an ice cream maker, you can make this recipe with our easy freezer method.